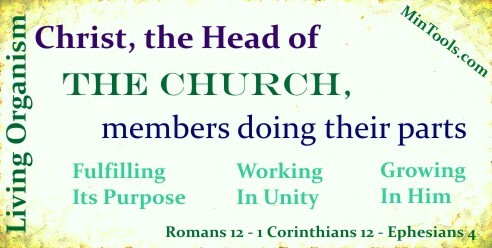 How Does Organization Help the Church Function as a Living Organism? Living organisms have a purpose that requires them to function a certain way. Organization provides a plan, or process, for living in accordance with our purpose. Ask: Does our organizational planning help us better accomplish our purpose by helping members identify and do their part? Living organisms need an integration of its parts into the whole. When members do not do their part for the good of the whole, the Body is lacking in some way. Organization provides coordination. Ask: Do our organizing efforts bring us together or actually serve to fragment the Body? Living organisms need to be growing. If they aren’t growing, they’re dying. Organization provides structure for growth. With Christ as the Head of the Church, leaders equip members to do their parts and the Body grows and builds itself up in love (Eph. 4:15-6). Ask: Is our organizational structure helping us grow or simply maintain status quo? Let’s make sure organization helps us experience Body life, not hinder us from being that living organism God designed us to be.